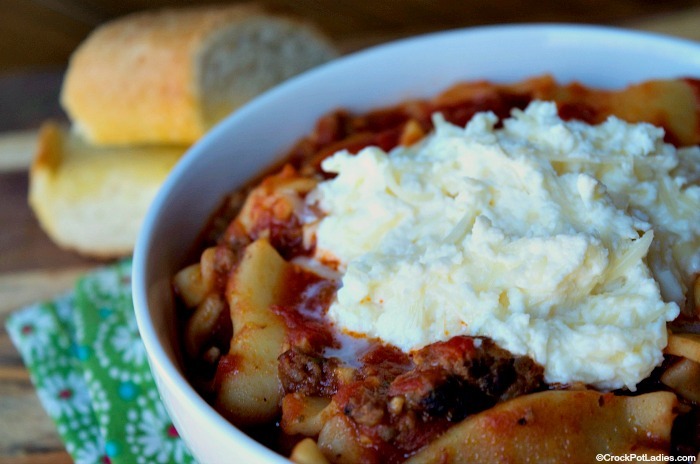 All the flavors of your favorite lasagna recipe only in a delicious & hearty Crock-Pot Lasagna Soup that will satisfy you any day of the week. When the weather is cold my favorite food to eat is soup. Soup with bread. It does not matter what kind of soup because to me a big bowl of hot soup is my go-to comfort food! My favorite food growing up was lasagna. We had a local Italian restaurant called Avanti’s and they had some of the best lasagna I have ever eaten. They would serve it with this out-of-this-world homemade bread. It makes my mouth water just thinking about it. I lived off of lasagna and spaghetti for many years as a young adult because Avanti’s delivered! 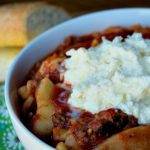 Because I love soup and lasagna I decided that I needed to combine by two favorite comfort foods and make a soup that has all the flavors of lasagna. This recipe has plenty of Italian sausage to give it a nice flavor, and then there are tomatoes, onion, garlic and all the other wonderful flavors you would find in a good marinara sauce. This all is simmered away in the slow cooker for hours. And then…about an hour before the end of the cooking you throw in some broken up lasagna noodles and let them cook in the soup. Spoon this lovely soup into bowls and serve it with a dollop of a lovely ricotta cheese mixture. I love this soup with a little toasted garlic bread on the side. I use Mortons Garlic Sea Salt seasoning because it makes some garlic bread out of this world. And then you have a dinner (or lunch) that everyone will love! 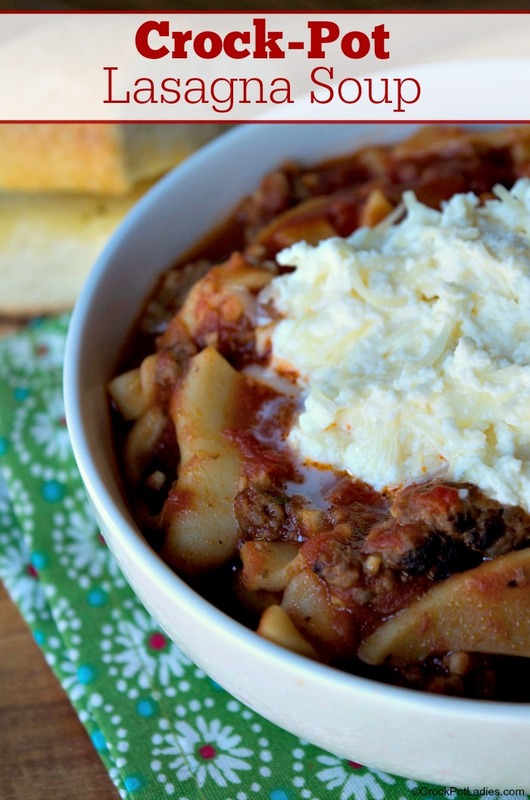 This fantastic slow cooker lasagna soup recipe combines all of the hearty flavors of your favorite Italian lasagna recipe in a amazing soup. In a large skillet on the stove top cook and crumble the Italian sausage, onion and garlic until the sausage is no longer pink and the onions start to become translucent. Drain off the excess cooking fat from the sausage mixture. 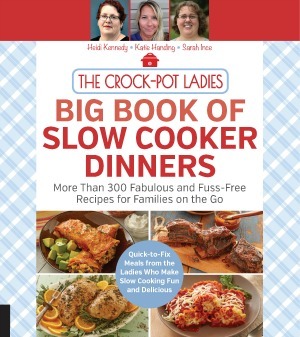 Add the sausage, spices, canned tomatoes, tomato juice and chicken broth to a 5 quart or larger slow cooker. Add in the broken lasagna noodles and cook an additional 1 hour until the noodles are al dente. In a mixing bowl, mix together the ricotta cheese, mozzarella and Parmesan cheese. Top the soup with a spoonful of the ricotta cheese mixture before serving.